The divorce is over, the couple has moved on, but what about the kids? When parents get divorced, children suffer deep pain and confusion. 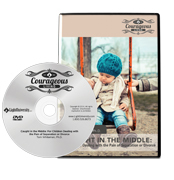 Caught in the Middle features the most commonly asked questions and concerns from children while offering parents practical guidelines to help children cope. Dr. Whiteman guides viewers through the stages of divorce and offers help for kids of all ages. A must-see for those dealing with divorce. It’s also great to give to friends facing the pain of a broken marriage and fractured family.